Candy Crush Saga, if you are wondering. And if you are wondering why Beirti is not allowed to have any devices at the table, here’s why. I was hoping to have played XCOM by now, but it didn’t make it into stores before Christmas, and its release is still eminent. 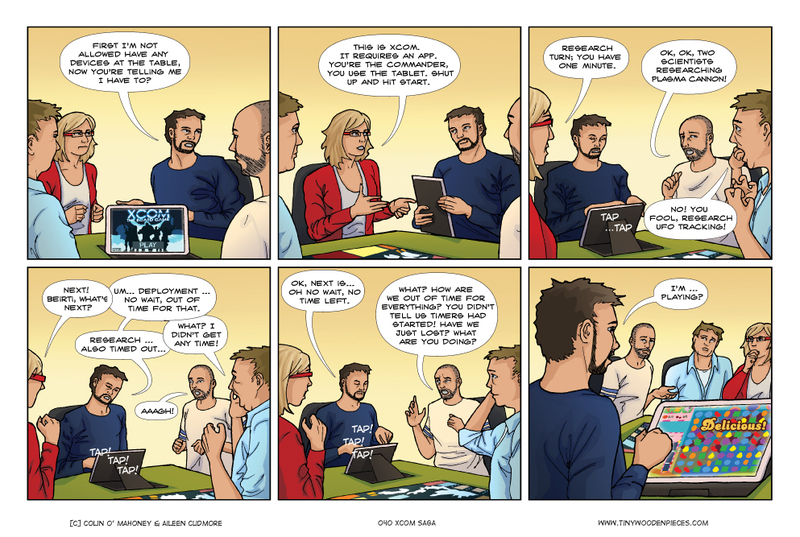 The comic is more about the melding of digital and analogue than it is the game itself, though, so I felt comfortable doing a comic with the XCOM board game in it. XCOM is a real time board game that requires the use of a free companion app, one that essentially acts as a form of DM for the game: advancing threats, keeping time, adjusting the game according to how the players are reacting and dealing with the threats it continually spews out, like so much green mucus at an alien autopsy. This, to me, sounds great (the app, not the green mucus). While games like Pandemic do an incredible job of managing threat with cards and counters, the promise of XCOM is a more advanced level of game interaction, and a more ‘intelligent’ system of threat than cardboard can manage on its own. If the game lives up to this promise, then I will be glad to welcome technology to the table. Even if it does not, in fact, I will look on it as a failed experiment; simply a wobbly stepping stone on the path to a more happy, and indeed inevitable, union of digital and analogue. The requirement of an app for the game is, of course, divisive. People points towards games of a long-gone era, the likes of Atmosfear, which required a companion app itself, in the form of a VHS cassette and player. You can (quite rightfully) point out that even if you still owned a copy of Atmosfear, it would be nigh-impossible to play it, because long before Netflix killed DVDs, DVDs left VHS for dead. Finding a VHS player nowadays is as likely as finding someone who can explain the plot of the X-Files from start to finish in one sitting. Is this a valid arguement against games that require technology? Perhaps. But as it happens I DO still own a copy of Atmosfear, but even if I still had a VHS player, I would not want to play it. It’s not the technology that’s defunct, it’s the game. It’s pretty terrible. So if, in ten years time I still want to play XCOM, then well done Fantasy Flight for making a classic. And if in ten years time people are still playing it, I’m sure Fantasy Flight or the games’ fans will find a way to support it. I don’t doubt it in the least. I have the DVD version of Atmosfear (it’s different) and also the PC version!. Still fun occasionally in the right company, but I think the original VHS was the best. As for cool tech in games, have you seen Alchemists? It’s a deduction game which uses a phone app to keep the information secret. It works really well, although I don’t actually think it’s that good a game. I actually didn’t realise there were DVD and PC versions of Atmosfear! Interesting then that even Atmosfear survived the death of it’s old technology. Alchemists is a game we are actually very excited about, it looks like another great implementation of an app with a game. Haven’t played it yet, but we are eager to get our hands on it. You didn’t enjoy it that much yourself, I take it? OK, cool, thanks for the feedback on the game.. As I say, it’s a game we are excited to get, so I was curious to hear what put you off it. I don’t mind worker-placement at all, and the theme of this is really appealing as well.